I’ve literally just been chatting with a friend about how much we need this book. This post has just made my night/early morning! So very excited! Yay you!! The rereading will commence. WooHoo. 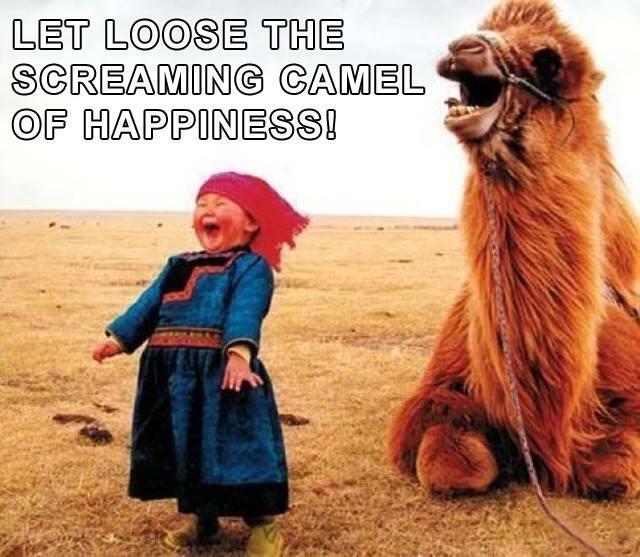 Just as long as the camel doesn’t spit. Oh yeah! You just made my day! You just made my day. Can’t wait to read it. By the way, that has got to be the happiest picture I’ve seen in a long time. Yeah, what Angel said! But seriously Congrats on finishing!! Yea for us readers,we are the big winners here. Can’t wait to read it. Man did I need this one today! OMG! I am so happy! The little girl in that shot is definitely me! can’t wait for it to be released. Thank you, thank you, thank you! Fantastic!! Can’t wait to get my hands on it!! Yay! Well done! Cant wait to have it!